Audiences react in different ways to different pieces of theater. But there are some shows that elicit almost the same reaction from everyone who sees them. A gasp of recognition or understanding. Wide eyes. People asking each other "What can we do to change this?" How I Learned to Drive, The Normal Heart, Bhopal... These plays ask you not just to pay attention, but to learn more, push on, help out. And The Exonerated goes at the top of that list. The Exonerated, which was written by Jessica Blank and Erik Jensen based on interviews, transcripts, letters and court documents, is an eye-opening piece about the American criminal justice system and the huge cracks that pervade that system. The play centers on six "exonerees," people sent to Death Row for crimes they did not commit who were ultimately freed. Some were exonerated by DNA evidence, others were granted new trials or new deals because of the flaws in the first one, and some are still trying to clear their names years after new evidence surfaced. Cleared or not, exonerated or set free, these people found their lives changed forever. Each of the six exonerees in the play gets a chance to step forward and tell his or her story, providing a broader picture of police and prosecutorial misconduct, stupidity and myopia, abuse of power and abuse of the powerless. The system we see in the play is one that lumbers toward an inevitable conclusion and punishment no matter what came before it. As social commentary, The Exonerated provides broad questions about justice, the death penalty, race and fairness. As theater, it presents six terrible, terrifying stories of very real people stuck in a nightmare they can never completely escape. For Illinois State University, director Cyndee Brown focuses on them as people, on who they are as individuals and why they are different from each other, on where they manage to find tiny sparks of hope, on how they manage to go on. She elicits terrific performances from her entire ensembles cast, with Tim Jefferson leading the way as Delbert Tibbs, a theology student and poet who found himself convicted of murder although he did not fit the description of the killer and the only evidence against him was the testimony of a witness who kept changing her story. Tibbs is the heart of the story as constructed by Blank and Jensen, and Jefferson does a beautiful job revealing that heart. The script provides heartfelt moments for each of Brown's players, from Sydney Moody's hapless Sunny, a hippy who associated with the wrong people, undone by her ignorance about the legal system; to Joe Faifer's sweet, uncomprehending Gary, an Illinois farmer accused of murdering his parents and held without a lawyer for some 20 hours while police coerced a "vision statement" in lieu of a confession; Nathaniel Aikens Jr.'s feisty Robert, a black racetrack worker convicted on the basis of bad DNA evidence; Gregory D. Hicks' David, a kid when he went to Death Row but not when he came out; and Levi Ellis' Kerry, a victim of police and prosecutorial misconduct that continues to this day. Each of them talks straight to the audience, showcasing not just the pain and anger, but the humanity that make the characters come alive. Mary DeWitt, Anastasia S. Ferguson, Thomas Howie and Dave Krostal fill out the ensemble, playing multiple roles as the spouses, lawyers, cops and witnesses who surround, support and come into conflict with the exonerees. That means their roles are not always as showy as the wrongfully accused, but they provide a crucial context and frame for the drama. The Exonerated is staged simply to fit inside the intimate space in Centennial West 207, although Jen Kazmierczak's plain platforms, backdrops and chairs create the right mood, Hilary Winkworth's costumes are effective throughout, lighting designer Will Wermerskirchen does great things with stark lights and shadow, and sound designer/composer Chris Cummings ramps up the tension and sends home a definite message when we hear the hard slam of doors and a rough buzz of electricit. This weekend, the show sold out its Friday and Saturday performances so be sure to get reservations ahead of time if you're planning to go for next week. 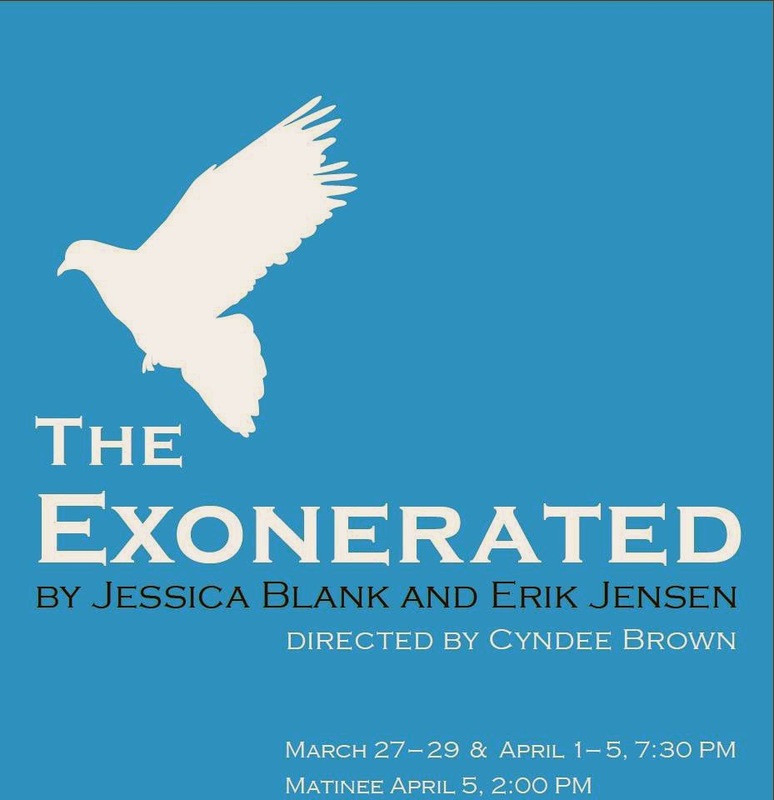 The Exonerated continues through April 5 in CW 207 on the ISU campus. Tickets are available through the Center for the Performing Arts box office. If you would like to learn more about the process that helped free the people in the play, or you left the play wondering "What can we do?," you can visit the Exoneration Registry, the Innocence Project, the Innocence Network, the Center on Wrongful Convictions, the Exoneration Project or the Death Penalty Information Center's Innocence List. Each of those projects comes from a law school or other entity devoted to defining the issues and the scope of the problem as well as helping individual prisoners overturn wrongful convictions and return to the world. Cast: Nathaniel Aikens Jr., Mary DeWitt, Levi Ellis, Joe Faifer, Anastasia S. Ferguson, Gregory D. Hicks, Thomas Howie, Tim Jefferson, Dave Krostal and Cydney Moody. Running time: 1:45, played with intermission. Disclaimer: I came in to talk to Cyndee Brown's cast about legal issues on two occasions and I am not remotely unbiased on this play or this production. Wonderful account, love the disclaimer!